The city has something to offer everyone, with many exciting entertainment options. To really experience the local flavor, you can take in some Sichuan Opera karaoke, where you will hear them enthusiastically shouting out their favorite lines. The locals are fond of reading as is evident by the many book bars here, which offer a relaxing environment and good books. Chongqing is also not short of nightlife, boasting bars, movie theaters and dance clubs, which bring the city alive in the evening hours. 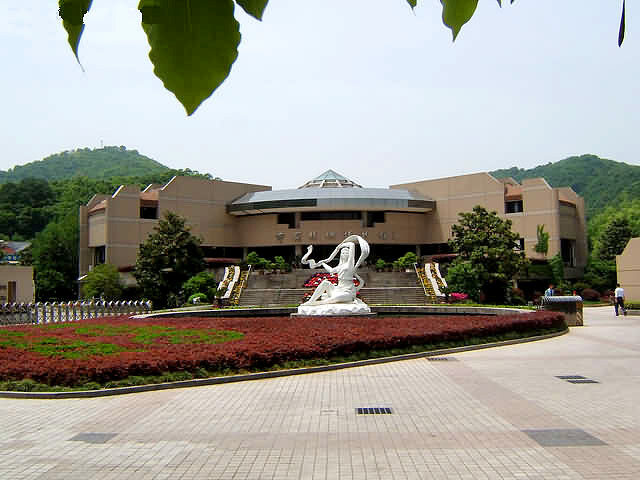 Try one of the recommendations given below to get a real taste of Chongqing lifestyle. Chongqing is known for its acrobatics performances. - Balancing on a Plank and Bowls Topping - by the Chongqing Acrobatic Troupe won a silver medal at the Ninth World Acrobatics of Tomorrow Festival and the troupe's - Plate Spinning and Jumping through Hoops - were winners of the Silver Lion Medal at the National Acrobatics Tournament. The skillful feats of strength, balance, and dexterity will leave you shaking your head in your amazement. After viewing the shimmering waters of the Yangtze and Jialing Rivers from South Mountain, you may also want to take a night tour aboard a cruise ship to view the city's night views. 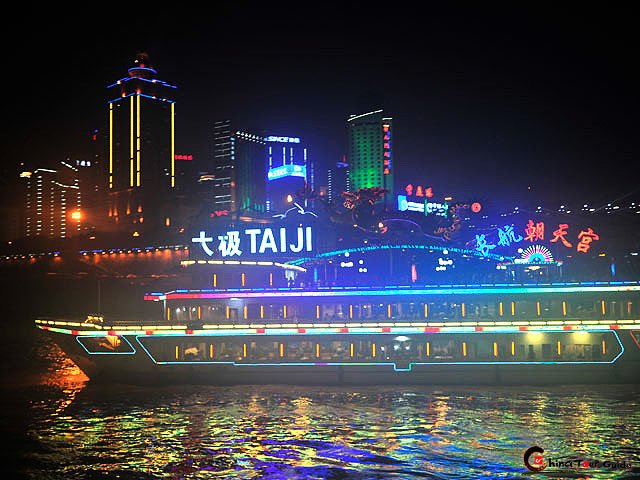 Fares for a 2-hour cruise tour range from RMB30 to RMB80 per person. Tours run from 7 to 10 o'clock in the evening and depart from the Chaotianmen Dock. Dragon lanterns made in Tongliang County, Chongqing are known far and wide. During the Lantern Festival (15th of the first lunar month), locals gather to participate in the wildly popular dragon lantern dances. When night falls, the excitement begins. 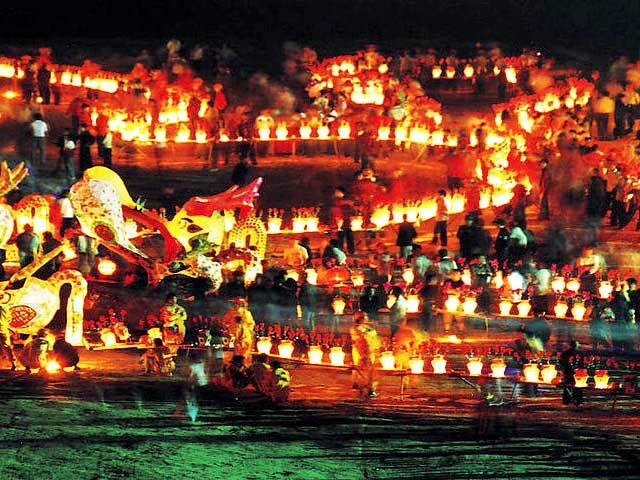 Colorful lights line the roads and the dragon dances themselves appear in the dark almost as live dragons roaming the streets in a river of light. Percussion instruments keep the beat while spectacular firework displays streak across the night sky. It is an exhilarating scene full of celebration and would take a Scrooge indeed not to catch the joyful spirit. Stretching alongside the Yangtze River, you should have no problem finding Nan Bin Road--just look for the dazzling neon lights. 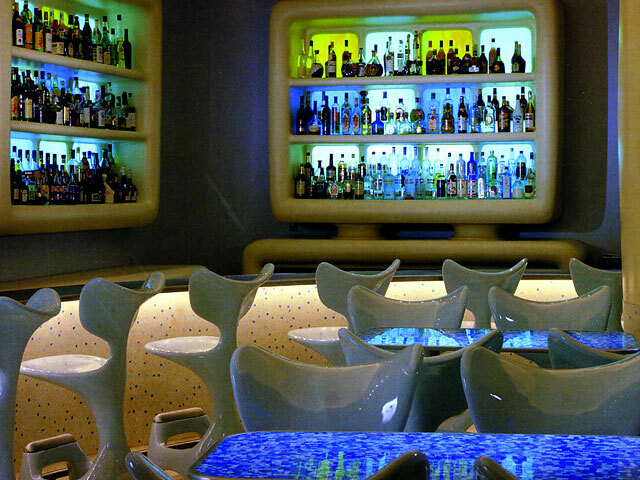 It is a good place to relax where you will find many bars, pubs, cafes, and teahouses, each offering a unique style and flavor. The street has become a hub for nighttime leisure.